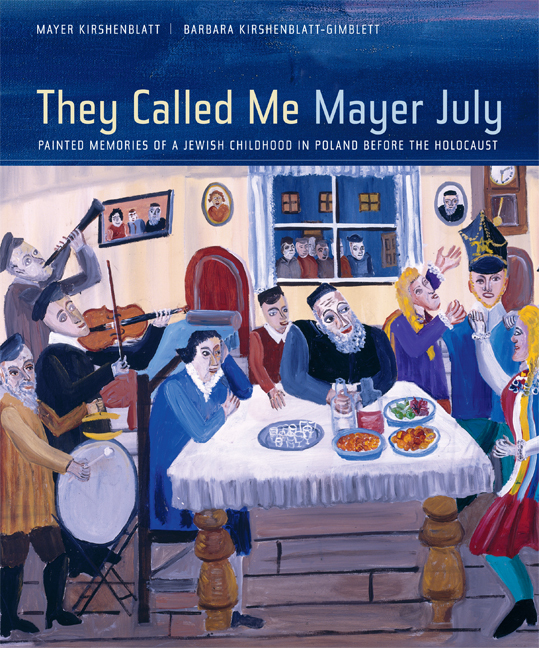 Intimate, humorous, and refreshingly candid, this extraordinary work is a remarkable record—in both words and images—of Jewish life in a Polish town before World War II as seen through the eyes of an inquisitive boy. Mayer Kirshenblatt, who was born in 1916 and left Poland for Canada in 1934, taught himself to paint at age 73. Since then, he has made it his mission to remember the world of his childhood in living color, "lest future generations know more about how Jews died than how they lived." This volume presents his lively paintings woven together with a marvelous narrative created from interviews that took place over forty years between Mayer and his daughter, Barbara Kirshenblatt-Gimblett. Together, father and daughter draw readers into a lost world—we roam the streets and courtyards of the town of Apt, witness details of daily life, and meet those who lived and worked there: the pregnant hunchback, who stood under the wedding canopy just hours before giving birth; the khayder teacher caught in bed with the drummer's wife; the cobbler's son, who was dressed in white pajamas all his life to fool the angel of death; the corpse that was shaved; and the couple who held a "black wedding" in the cemetery during a cholera epidemic. This moving collaboration—a unique blend of memoir, oral history, and artistic interpretation—is at once a labor of love, a tribute to a distinctive imagination, and a brilliant portrait of life in one Jewish home town. Mayer Kirshenblatt is an artist living and working in Toronto. His work has been exhibited in solo and group exhibitions at The Jewish Museum in New York, Koffler Gallery, and Canadian National Exhibition, as well as in an exhibition organized by the Smithsonian Institution. Barbara Kirshenblatt-Gimblett is University Professor and Professor of Performance Studies at New York University. She is the author of Destination Culture: Tourism, Museums, and Heritage (UC Press) and Image Before My Eyes: A Photographic History of Jewish Life in Poland Before the Holocaust (with Lucjan Dobroszycki) and coeditor of Art from Start to Finish and The Art of Being Jewish in Modern Times.